Too Much Pepper – Tomato Town organically grows heirloom tomatoes in the greater Kansas City area as well as Johnson County, Leawood, Lenexa, Olathe, Shawnee, Merriam KS, Independence MO and Kansas City Missouri, KCMO. Varieties include: Cherokee Purple, Brandywine, Stupice, Carbon, Black Krim, Black Cherry, Yellow Pear, Absinthe and Aunt Ruby’s German Green. When you grow as many tomatoes as we do, you start hankering for salsa. So we grow a fair number of peppers, both sweet and hot. This year, our favorite so far is the prolific Albino Bullnose. 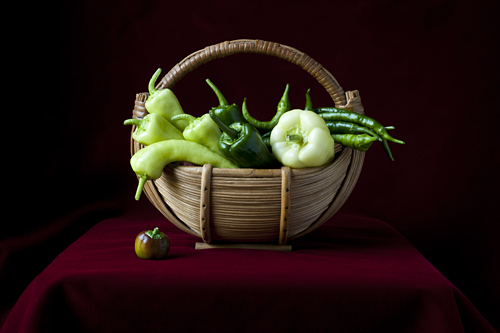 We also enjoy poblanos, red mini bells, and yellow banana peppers. This entry was posted on Thursday, June 28th, 2012 at 12:00 pm. It is filed under Companion Plants, Latest Posts. You can follow any responses to this entry through the RSS 2.0 feed.